This time of year is all about being thankful for the things you have. That might be a new promotion, a relationship, or even something as simple as a shorter commute. Those living in the rentals in San Pedro, CA, might not realize how many things they have to be thankful for just by living in the area. Dubbed, “the last affordable beach town,” this community offers a bounty of perks that often become second nature to the residents here. So much so that people tend to take them for granted. If you sit down and think about it, however, there’s so much to be thankful for in San Pedro. For many, San Pedro offers a safe haven to raise children. It’s walkability and green space create a warm environment, while the number of families living in the area offer plenty of playmates and like-minded thoughts on safety. Parents also enjoy simple commutes to the bulk of Los Angeles, giving them more time to spend with their kids. Speaking of easy commutes, there are plenty of ways to get to your place of employment. You could take the 110 freeway for a straight shot to DTLA, ride the LADOT commuter express line, or hop on a train from the Harbor Transit Center. The ability to get to and from work with as little effort as possible is definitely something to be thankful for in the LA area. While San Pedro offers a close proximity to Los Angeles, it also provides a charming small-town appeal. Locally owned corner stores, 1920’s bungalows, and a tight-knit community all create a unique environment outside of the city. Despite the town-like vibe, the area remains diverse and culturally sophisticated. Finally, the cost to live in San Pedro is drastically cheaper than living in the city or the surrounding beach towns. What might cost upwards of $1 million in Silver Lake is a fraction of the price here. That goes for apartments, too. New luxury high rises provide the quintessential LA experience without costly downtown prices. There are plenty of restaurants in San Pedro, but Californians have a taste for something simpler and more natural. Fresh produce from farmers markets and quality meat from three local butchers is more than most could dream of so close to the city. Don’t forget about the readily available fresh-caught fish, too. The ability to cook fresh, healthy meals is a blessing. Of course, so is going out to eat at a delicious restaurant. Steaks at J Trani’s and sushi at Senfuku are just two of the great options available and might just be the best in the entire area for their specialties. Don’t forget about The Taste of San Pedro, offering tastings from numerous local establishments and craft breweries. Every location has a few hidden gems up its sleeve. San Pedro is no different, with House 1002 taking the cake. This antique store carries the neatest inventory to help you find something unique on every visit. Plus, their pricing is excellent. JD Hobbies offers collectors the rare and eclectic, while the historic Warner Grand Theater helps residents get their fix of the arts. 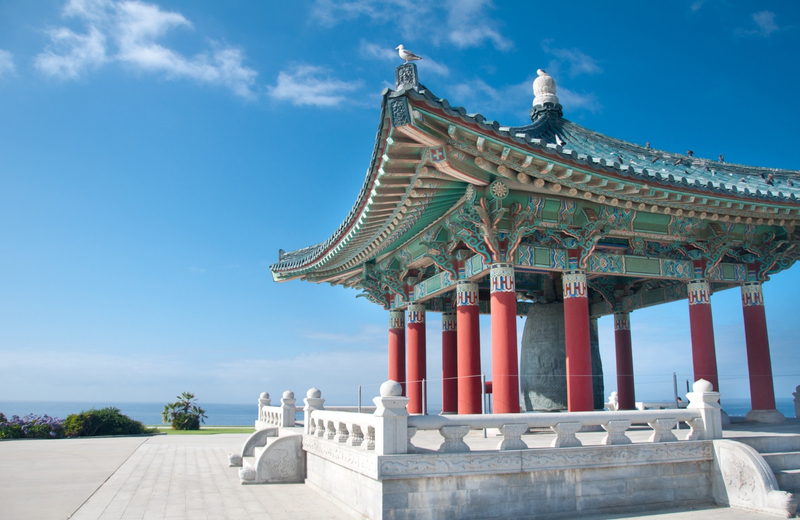 The area is home to tide pools that make for the ultimate day-trip, but one of the most interesting gems hidden in San Pedro is the Korean bell of Friendship. Donated in 1967 by the Republic of Korea, this massive structure is intricately decorated and resides in a pagoda-like stone structure. It stands in honor of those who fought in the Korean War, as a symbol of independence, and remains one of the best places to catch a breathtaking view of the Los Angeles Harbor. There’s also the Grunion Run. Each year, residents can sit on SoCal’s sandy shore as they wait for these small, sardine-size fish to wash ashore and paint the beach a shimmering silver color. The ability to have both city life and nature just ten minutes in either direction is deserving of thanks, right? There’s a lot to be thankful for this year while living in San Pedro, and The Vue is one of them. These high-rise apartment homes offer a captivating living environment, soaring above downtown San Pedro and the Los Angeles Harbor. With fully-equipped, modern interiors and resort-style amenities, you’re right in your comfort zone. Each home within The Vue features luxury finishes from imported tile flooring to sleek modern faucets. Upgraded cabinets and appliances provide a modern appeal, while floor to ceiling windows offer ample amounts of natural lighting and stunning ocean views. A stacked washer and dryer eliminate the tedium of community laundry day, which is one more thing to be thankful for. With homes ranging from one to three bedrooms, up to 1776 square feet, you can kiss cramped apartment life goodbye. On-site amenities come in a variety of forms. Stay active in the state-of-the-art fitness center, take care of today’s business dealings in the conference room, or socialize in the clubhouse and media lounge. After a long day, relax in the resort-style pool complete with cabanas or take in breathtaking views of the surrounding area from the sky lounge and rooftop terrace. For life’s smaller obligations, 24-hour concierge service takes care of everything so you can focus on what’s important. Just outside your front door lies an immersive community filled with charming cafes, microbreweries, and upscale restaurants waiting to be discovered. Corner stores, bakeries, and more fill the tight-knit community of San Pedro while providing a wholesome, unique experience you won’t find in the city. Elevate your everyday with the finer touches of luxury living. We invite you to experience the wonderful town of San Pedro in comfort and style. With modern finishes that create envious homes, carefully curated amenities to compliment your lifestyle, and a premier location in the Los Angeles area, what’s not to love? Seaside chic and city close, that’s The Vue.